A region steeped in myth and legend, of ancient gods and spectacular landscapes, inviting hospitality and cities that almost call out to be explored; Egypt, Jordan and Turkey are three of the world’s most evocative destinations. Discover them for yourself on this once-in-a-lifetime 26 day journey. Take a journey through the past and present with visits to Cairo, Istanbul, Petra, Amman, Luxor and more. See the famed Blue Mosque and Topkapi Palace on a tour of Istanbul; separate fact from fiction as you explore the ancient ruins of Troy, Ephesus and Hierapolis; and view incredible natural rock formations in the Devrent Valley of Cappadocia. Feel dwarfed by the mighty sphinx and pyramids of Giza; view the stunning temples of Karkak, Deir el-Bahri and Abu Simbel; and admire the ever-changing scenery as you sail down the Nile aboard a five-star river cruise. Then, travel into the vast desert of Wadi Rum; visit the ancient rose-coloured city of Petra and so much more! Includes return international flights, four internal flights, a four-night 5-star river cruise, 18 nights 4-5 star hotel accommodation, an overnight glamping experience in the desert and more. Today depart from Auckland for Istanbul, Turkey! Fly with award winning airlines such as Emirates, Etihad Airways or Qatar Airways to name a few (subject to availability). Upon arrival, you will be transferred to the hotel. This evening enjoy a welcome dinner at the hotel. Following breakfast this morning you will be picked up from the hotel for a day tour of old Istanbul. Visit Topkapi Palace, the great palace of Ottoman sultans from the 15th to the 19th centuries, which houses an exquisite collection of crystal, silver and Chinese porcelain. Robes worn by the sultans and their families, the famous jewels of the Imperial Treasury, miniatures, the Holy Mantle, and enshrining relics of the Prophet Mohammed are also featured. Next you will see Sultan Ahmet Imperial Mosque, built in the 16th century by the architect Mehmet. It is perhaps more commonly known as the Blue Mosque, due to its magnificent interior decoration of blue Iznik tiles. Afterwards you will see the ancient Hippodrome, the scene of chariot races, with the three monuments; the Obelisk of Theodosius, the bronze Serpentine Column and the Column of Constantine. After lunch you will visit the Spice Bazaar (Egyptian Bazaar). The air here is filled with the enticing aromas of cinnamon, caraway, saffron, mint, thyme and every other conceivable herb and spice. This evening you have the opportunity to join an optional evening cruise (not included). This evening join a dinner cruise and see sights such as the Bosphorus Bridge, which runs from Europe to Asia. Also see the Imperial Gardens of Royal Yildiz Palace, Ciragan Palace, Camlica Hill, Kempinski Hotel, Dolmabahce Palace, Rumeli Fortress and Beylerbeyi Palace. Today you will depart for Gallipoli to visit the battlefields. Along the way there will be a rest stop in a restaurant area. Arrive in Gallipoli around midday and enjoy lunch before departing for the battlefields. Visit Kabatepe Museum, Ari Burnu Cemetery, Anzac Cove, Beach Cemetery, Shrapnel Valley and Plugge’s Plateau. Afterwards head to Canakkale for the night. Today you will visit the famous archaeological site of Troy, known for the Trojan Horse and story of Helen of Troy. After the tour drive to Pergamon. Upon arrival, enjoy lunch before setting off on a tour of the acropolis of Pergamon - its impressive temples and library made it a cultural and political centre at the time. Pergamon is famous for its jewellery, stones and silver, and today you will see this firsthand with a stop at a jewellery centre. Arrive in Kusadasi this evening in time for dinner. Today enjoy a guided tour of Ephesus, one of the best preserved ancient sites in the world. Visit the Temple of Artemis, Curetes Street, Roman baths, Celsus Library, Grand Theatre and the House of the Virgin Mary. After lunch, visit a place which continues to perform one of the oldest arts of Turkey; a carpet weaving centre. Afterwards enjoy a tour of the Turkish village of Sirince - a pretty village that mostly dates back to the 19th century with original white painted houses. Sirince also has a fantastic reputation for producing some of the best wines in Turkey - especially fruit wines. Visit a vineyard and learn how to make fruit wine with Turkish wine makers. On the way back to the hotel visit one of the famous leather production centres of the region. Depart for Pamukkale after breakfast this morning. Upon arrival check-in to the hotel and enjoy lunch. Afterwards you will visit the famous calcium terraces of Pamukkale (which means ‘cotton castle’ in Turkish) and the ruins of Hierapolis. Walk around this natural phenomenon and have the option of laying in the mineral-rich waters of the natural springs. After an early breakfast, depart to Konya at approx. 8:00am. After 2.5 hours enjoy a break for coffee and some rest before getting back on the road, aiming to arrive in Konya for lunch around 1:00pm. After lunch, visit the imposing green - tiled Mausoleum of Mevlana, the mystic founder of the Sufi sect (Whirling Dervishes). Afterwards depart for Cappadocia, arriving at around 6:30pm to check into your hotel. Early this morning there is an opportunity to join an amazing optional experience - hot air ballooning over the Cappadocia area (not included). Today you will experience a tour of Cappadocia. Drive to Ozkonak Underground City, one of the area’s best preserved underground cities, and then visit Uchisar Castle, the highest point of Cappadocia. Next you will visit Goreme Open Air Museum, famous for its 16th century frescoes, which depict the life of Jesus Christ and monks. After lunch, visit a pottery work shop and see how pottery is made. Then, visit Pasabagi where you can see three headed fairy chimneys. Afterwards visit another workshop to see handwoven carpets and kilims. The next stop is Devrent Valley, also called Imagination Valley, where you can see natural rock formations. Then you will have some time for shopping at a Handicrafts Centre. The last stop is the Three Beauties, three beautiful fairy chimneys with their hats, which is the symbol of Cappadocia. After the tour transfer back to hotel. Take in the breathtaking landscape home to magnificent valleys, volcanic rock formations, spectacular pigeon houses ,and a view that is best described as ‘unforgettable’. The tour includes a buffet breakfast, a champagne toast on landing, and a commemorative flight certificate. Please note: the tour will return in time to join the group for the day’s activities. Today depart for Kayseri Airport for a domestic flight to Istanbul, where you will take an international flight to Cairo -the sprawling capital of Egypt. Upon arrival, be transferred to your hotel. In the evening enjoy a group welcome dinner in Giza. Your Egyptian odyssey begins at the amazing Great Pyramids of Giza and the nearby Sphinx. At 500 feet high and 750 feet wide at its base, the Great Pyramid of Khufu (Cheops) is a breathtaking man-made structure, built from enormous stone blocks with a white limestone covering. Together with the smaller pyramids, the sight of these huge structures is unforgettable. Afterwards, visit the ancient capital of Memphis and the famous Step Pyramid of Sakkara. Today enjoy a visit to the 12th century Saladin Citadel of Cairo and the Mohammed Ali Mosque. Afterwards discover the 14th century souk, Khan el-Khalili Bazaar, famous for its handmade crafts. In the afternoon, explore the world-famous Egyptian Museum, home to the Tutankhamun exhibit and a staggering number of other ancient Egyptian artefacts. This morning transfer to the Cairo Airport for your internal flight to Luxor in Upper Egypt. Upon arrival, explore the fascinating Karnak Temple, dedicated to the Pharaoh Amun, and once linked to the Luxor Temple by the three-kilometre-long Avenue of Sphinxes. In the afternoon you will be transferred to the Luxor cruise port to embark on your four-night 5-Star Nile River cruise. 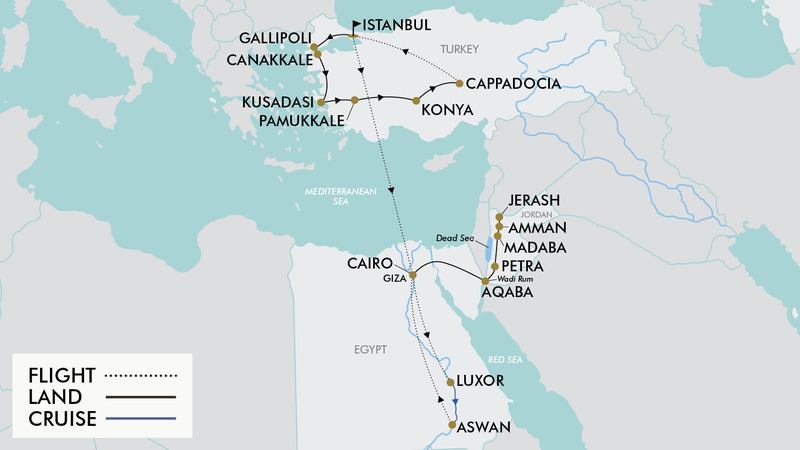 This morning, the ship will cross to the West Bank of the Nile to explore the Valley of the Kings, known as the "Gateway to the Afterlife"; which provides a window to the past. Many of the tombs within the valley were once filled with an abundance of antiquities. Though many suffered at the hands of grave robbers, others thankfully remained unscathed. Next is a visit to Deir el-Bahari, the mortuary temple of ‘Pharaoh Queen’ Hatshepsut. Rising out of the desert sands in a series of terraces, it’s an incredible sight to behold. On the way back to the river Nile, the road passes by the famed Colossi of Memnon, two massive stone statues of the Pharaoh Amenhotep III. This morning visit the magnificent Temple of Horus. The temple was the 'home' and cultural centre of the falcon god Horus of Behdet (the ancient name for Edfu), and remains one of Egypt’s best preserved temples. Once back onboard, continue sailing to Kom Ombo, where you will visit the Temple of Kom Ombo. Dedicated to Sobek the crocodile god, and Horus the falcon-headed god, the temple occupies a stunning location overlooking the Nile. In the afternoon, the cruise continues to Aswan. Tonight, experience a galabeya (a traditional Egyptian garment) party on board. An early start this morning to cross the desert to visit the incredible Abu Simbel, which was originally carved out of the mountainside during the reign of Pharaoh Ramses II in the 13th century BC, as a monument to himself and his queen, Nefertari. The complex was relocated to higher ground in its entirety in 1968 to make way for the Aswan High Dam reservoir. In the afternoon relax on board a traditional felucca as you cruise down the Nile towards Aswan. After breakfast, disembark the cruise ship in Aswan before enjoying a sightseeing tour of the city. See highlights such as the impressive Aswan High Dam, the picturesque Temple of Isis on Philae Island, and the Unfinished Obelisk. Afterwards transfer to the Aswan airport for your flight to Cairo, where you will enjoy one last group dinner to farewell Egypt. An early start this morning as you depart for Aqaba, a picturesque resort town on the Red Sea. Today will be a travel day, however there will be pit stops along the way to keep everyone fresh. The drive will take you to the Nuweiba Port in South Sinai, where you will embark a ferry to Aqaba (approx. 2 hours sailing). Upon arrival be met and transferred to the hotel. After breakfast, head to Wadi Rum, a protected desert wilderness in southern Jordan. It features dramatic sandstone mountains like the many-domed Jebel Um Ishrin, and natural arches such as Burdah Rock Bridge. Many prehistoric inscriptions and carvings line rocky caverns and steep chasms, such as Khazali Canyon. The natural watering hole of Lawrence’s Spring is named after British lieutenant T.E. Lawrence (best known as Lawrence of Arabia), who allegedly washed there. Enjoy an exciting jeep tour through the dunes, and then ride a camel through the uniquely shaped landscape. Tonight enjoy accommodation in a Bedouin-style glamping desert camp under a blanket of stars. After breakfast, depart for Petra, home to the iconic Lost City of Petra. On the way, enjoy a stop at ‘Little Petra’, which is believed to be a suburb of the Lost City. With a history dating back some 9000 years, it is one of the oldest archaeological sites in the Middle East. Afterwards continue to Petra for the night. Today visit the famous Lost City of Petra. Inhabited since prehistoric times, this Nabataean caravan-city, situated between the Red and the Dead Sea, was an important crossroads between Arabia, Egypt and Syria-Phoenicia. Petra is half-built, half-carved into rock, and is surrounded by mountains riddled with passages and gorges. It’s one of the world's most famous archaeological sites, where ancient Eastern traditions blend with Hellenistic architecture. Travel along the Siq, the main entrance which is a natural passage between two mountains, leading to the Treasury, the most elaborate temple in Petra. This morning continue north and visit Shobak Castle and the Crusader fortress of Kerak. Afterwards travel to the Dead Sea, the lowest point on Earth. The Dead Sea is a salt lake with banks more than 400m below sea level, the lowest point on dry land. Its famously hypersaline water makes floating easy, and its mineral-rich black mud is used for therapeutic and cosmetic treatments. Today travel to Madaba to see a beautiful mosaic map of the Holy Land in the Greek Orthodox church of St George. Then continue to the biblical site of Mt Nebo, which overlooks the Jordan Valley and the Dead Sea. Mount Nebo is where Moses was granted a view of the Promised Land. This afternoon we’ll arrive in Amman, Jordan’s capital, and enjoy a short city-sightseeing tour. Today visit the beautifully preserved cities of Jerash; a Roman city with cardo arches, theatres and Roman churches. Also visit Umm Qais, a Roman city with stunning views of Mount Tabor. Afterwards visit the impressive Ajloun Castle. In the evening, enjoy the opportunity to join an optional cooking class with your fellow travellers and enjoy each others creations for one last group farewell dinner. Today transfer to the airport for your return flight home after this trip of a lifetime! Please note: Due to flight scheduling, some customers will depart after midnight of Day 25 (early hours of Day 26). These customers will arrive home Day 27. Please note: Some flights may arrive + 1 days later. Travel offer is valid for travel on selected dates until the 12th of November 2020. For solo travellers, a mandatory single supplement of $1275 applies. Please note: Dates/months with a * incur a flight high season surcharge of $350 per person. Emirates, Etihad Airways, Qatar Airways, Turkish Airlines and any codeshare partners (subject to availability). - An outbound and inbound stopover may be chosen; however, the stopover location must be the same each way, due to the airline used. Please note: Rooms offered are based on a lead-in room type, and are subject to availability based on seasonality. Properties will be confirmed, no later than two weeks prior to travel. - Istanbul (Pre Tour): $150 per room (including breakfast). - Amman (Post Tour): $120 per room (including breakfast). - Valid for Children 12 years old and over. Subject to availability and at the hotel's discretion. Please enquire on booking if you require this option. Minimum group size 10, maximum group size 20 per vehicle. An experienced person tasked with ensuring the smooth operation of tours, as well as providing practical support to passengers throughout the whole trip. Their role primarily includes assisting with accommodation, transportation between locations, and communication with tour guides in each stop. A tour leader may provide general guidance around a city or village, and offer information on the place visited on the bus, however, they are not required to have specific knowledge on art, architecture, or history. They are not allowed to provide a guided tour or commentary of a city/village/attraction once there and if caught doing so, can be fined. There is never a shortage of sunshine in Egypt, with averages of 11 hours a day during the summer and 8 hours a day in winter. From April to October the average temperature ranges from 21-28C while between November and March this drops to 13-20C. This does vary along the Mediterranean coast which, while still warm, is more prone to periods of cloud and rain in winter. Generally, winters in Egypt are warm enough to allow pleasant and comfortable travelling all year long, though travellers should be prepared for cold nights. For ideal sightseeing conditions, the best time to visit Jordan is during the spring (March - May) and autumn (September to November) months. At these times of the year the temperatures are cool enough to spend your days exploring Jordan's iconic sites. Temperatures in May/June and September/October are between 22 and 30°C. January/December has an average temperature of around 15°C. Cappadocia has a continental climate characterised by dry summers and sometimes snowy winters. Rainfall is sparse and the region is largely semi-arid to arid. There is a sharp difference in the temperature between day and night and it is not uncommon to have cold nights interspersed with hot days. There are two main seasons in Kusadasi: the cold season and hot season, which basically correlate with winter and summer in other parts of Europe. The shoulder seasons, autumn and spring, experience weather patterns that are a mix of both the cold and warm seasons. Customers are required to provide valid passport details either at the time of purchase, or no later than 45 days prior to departure date. Failure to do so may result in cancellation of the booking. In this instance, customers will be responsible for any costs and fees incurred. 57 meals are included in the tour, for all other meals; lunches and dinners the tour leader (when available) will offer assistance with reservations, suggestions and directions to local restaurants. It is your responsibility to notify TripADeal of any dietary requests/requirements. Please note; we will do our best to meet your requests/requirements, however, cannot guarantee that we will always be able to. Our vehicles are not equipped with wheelchair access, so unfortunately, our tours are currently not suitable for wheelchair users and those less mobile. The recommended tip is 25 Lira (approx. $7 NZD) per person per day, which will be collected whilst on tour. This covers the tour leader/guide and driver. Gratuities and tips during the tour and cruise are at the customer's discretion. The recommended tip is $5 USD per person per day, which will be collected whilst on tour. This covers the tour leader/guide and driver. A tourist visa is not required for Turkey if travelling on a New Zealand Passport. A tourist visa for Jordan is a strict requirement if travelling on a New Zealand Passport. The tourist visa is available for purchase upon arrival. A tourist visa for Egypt is a strict requirement if travelling on a New Zealand Passport. Please note: Passengers who are not New Zealand citizens must check with the respective consulate or visa agency to determine what their visa requirements are and what personal identification is required. It is also important to note, some areas of employment such as journalism, government authorities and charity organisations may have additional restrictions in applying for Visas. This may in turn affect the type of application required.